Lara Bradley is another of our PlaySmelter veterans. We featured her first play last year Blind Nickel Pig, which is set to have its debut wit Encore Theatre in their upcoming season. This year, we offered her a closed reading of her newest play Sperm Wars. Do not let the name fool you: Bradley is playing with provocative concepts of pro-choice/pro-life, heterosexuality, suicide, fame, and chimerism. She’s cloaked these topics by setting the play in a reality TV show called ‘Sperm Wars,’ where the ultimate goal is to see which male contestant can impregnate the most women. Prizes are given for Best Mommy Ever, those who excel in parenting and/or maintaining their slim, beautiful bodies. Through this apparent light-hearted setting, Bradley is able to unearth deep, darker truths about the nature of conception. One of her main themes is chimerism. It is revealed in Sperm Wars that one of the characters is a chimera, flesh of one parent and blood of the other. One of our most interesting conversations was to speak about the specific science behind this, and if it is even possible for a person to be so cleanly split into flesh vs. blood. Would this character be a patched-up version of two people instead? Would his head be of one parent, but his chest of another? Ultimately, the more important question we posed to Bradley was: do you want an allegiance to science or imagery? Is it more important to be scientifically accurate, or to have the beautiful metaphor of someone split into flesh vs. blood? You can go either way in theatre, either sticking to the facts or embracing the mythic. How important is the mythic in this play? There are other subtle chimeras in the play—Alvin is creating a blended saxophone instrument called the Soprillo. Bradley also combines onstage action with technological projections, sometimes blending the two worlds by lifting a bed sheet from the set that becomes a projection screen. This, as well, is a chimera of sorts. 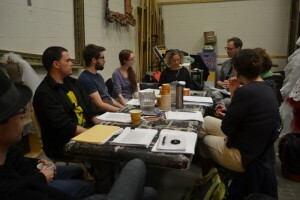 Dramaturgically, the use of technology works well throughout this piece; it is more than bells and whistles or something used to impress the audience. It is rooted in the mediatized life of this reality TV setting, and simultaneously reinforces the play’s central questions of nature vs. nurture, low tech vs. high tech, and the overarching warning of tampering with nature. We are constantly inundated with warnings and celebrations of technology, questions of have we taken it too far? Is tampering with nature part of the same warning? Sperm Wars subtly asks what are our chimeras, and will we take them too far?